It's a difficult time for feature phones, with smartphones fast becoming a viable option at the low-end of the market. On the one hand, most users are expecting smartphone features such as touchscreens and WiFi from their feature phones. At the same time, some folks still want an affordable, solid device that focuses primarily on making calls and sending text messages, with the occasional foray into entertainment and data-based communication. The Nokia X3-02 Touch-and-Type (not to be mistaken with the other Nokia X3) attempts to be that device, by adding a dose of touch and WiFi to the venerable Series 40 platform. Does it succeed? Read on. How would you rate the X3-02? Nokia sells hundreds of different phone models. Some designs are memorable, some are generic, yet somehow each remains instantly recognizable as Nokia hardware. The X3-02 continues this trend, and manages to be simultaneously appealing and understated. It's a tiny phone in a world of massive slates and sliders, with a footprint barely larger than the legendary Sony Ericsson W800 while maintaining the same ultra-thin profile as the iPhone 4. 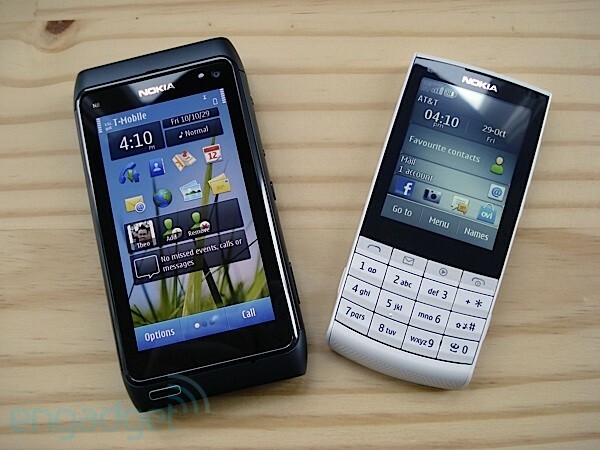 At first glance, it looks like just another candybar Nokia dumbphone, but with a bigger display. And this is where the Touch-and-Type moniker comes from: the front is dominated by a 2.4-inch QVGA resistive touchscreen paired with a 16-key numeric keypad below. Here Nokia decided to put the star, pound and zero keys in a column to the right of the number keys, with the call, email, music, and end keys in a row above the number keys. The display also contains the earpiece and proximity sensor. Continuing the walkaround, there's a standard 3.5mm headphone jack, microUSB connector (for both data and power), and the familiar Nokia 2mm charging port on the top edge, plus a volume rocker and lock button on the right side. You'll find matching battery cover release latches towards the bottom of each side, and an elegantly sloped and patterned bottom edge hiding the mic and speaker. In back there's a 5 megapixel camera above the battery cover. The X3-02 feels light but not unsubstantial, and build quality inspires confidence. High-grade plastics are used throughout, and the battery cover is stamped from a sheet of anodized aluminum. Our review unit came in White Silver, but the device is also available in Dark Metal, Petrol Blue, Pink, and a lovely shade of purple appropriately called Lilac. The only wear and tear we noticed after a few weeks of daily use was a few microscopic scratches in the plastic outer layer of the resistive touchscreen. Spec-wise, the X3-02 clearly falls into the feature phone category. It offers touch, WiFi b/g/n, an FM radio, and an unlocked quadband EDGE / quadband HSPA (AT&T-compatible) radio, but lacks any kind of GPS, accelerometer, or QWERTY keyboard. While no specific information is available about the speed and type of CPU used, or about the amount of RAM included, the phone feels adequately responsive running Series 40. The 5 megapixel camera generally lives up to Nokia's high standards for stills (more on this later). You'll find a microSD card slot under the battery cover, but sadly no card was provided with our X3-02. There's only a meager 50MB of usable built-in storage, so we supplied a microSD card. Call and reception quality proved typical Nokia, with top-notch performance all around. The diminutive 860mAh battery easily powered our review unit for 3 days of moderate use -- taking pictures, listening to music, and messaging. Despite lacking autofocus and a flash, the 5 megapixel camera performs rather well in most situations. The X3-02 uses an EDoF (Extended Depth of Field) lens. As a result, subjects or scenes beyond about two feet (60cm) are always perfectly in focus, but just like a fixed-focus lens, closeup shots are always blurry. Looking at our sample pictures, color balance is fine, but exposure is somewhat constrained by the sensor, which appears overwhelmed in bright light. Noise is under control, and low-light performance is decent considering the small lens and sensor. Since there's no accelerometer or GPS, shots lack any orientation or geolocation data. The camera interface is basic and portrait only, but Nokia provides a surprisingly capable picture editor. While the X3-02 handles stills with aplomb, it captures VGA video that is best described as mediocre. The sound quality is poor, and the framerate is capped to a jerky 15fps. Series 40 is used by hundreds of millions of people worldwide and is generally regarded as one of the more intuitive non-touch user experiences on phones. Adding touch to an existing platform is no trivial task, something Nokia learned the hard way when it transitioned Symbian from S60v3 to S60v5 with the 5800 XpressMusic. We're happy to report that Nokia avoided making the same mistakes with the Touch-and-Type version of Series 40: touch on the X3-02 is not a half-baked add-on. The interface is polished both esthetically and functionally, and the user experience remains intuitive. Gone are the 3 physical softkeys and the d-pad, replaced by 3 virtual softkeys (soft softkeys?) and direct touch navigation. There's kinetic scrolling, long presses, and haptic feedback throughout the interface. In addition to vibration feedback when tapping on the screen, you'll feel a haptic "bump" when scrolling to the end of a list or menu. While it's all very clever, several areas still require improvements. First, you'll find weirdly abbreviated descriptions like "Rest. fact. sett." liberally sprinkled all over the interface. These are confusing and detract from the overall experience. Second, relying solely on a numeric keypad for text input is just painful. We're aware that real estate is at a premium on the 2.4-inch touchscreen, but it looks like there's just enough room for a landscape QWERTY keyboard on the display. Third, Series 40 remains a dumbphone OS at the core, with no consistent notifications and no real multitasking. Nokia bundles apps for email and social networking, but only the latter dispatches notifications. Multitasking is limited to music playback and only functions when the camera is not being used. Finally, no GPS means Ovi Maps is not available and Google Maps is all but useless without a separate Bluetooth receiver. We're amazed that the X3-02 lacks even simple cell-based positioning. The default web browser is almost identical to the one in Symbian. It covers the basics (HTML, no Flash), but we experienced problems loading some sites like the full version of Engadget. Thankfully, Opera Mini comes pre-loaded and works like a charm. The built-in email client handles multiple Ovi Mail, Gmail, Hotmail, POP3 and IMAP accounts. According to the menus, Gmail integration also enables access to Google Contacts and Google Talk, but we never succeeded in setting this up. Unfortunately, there's no native Exchange support for email, contacts, or calendars. 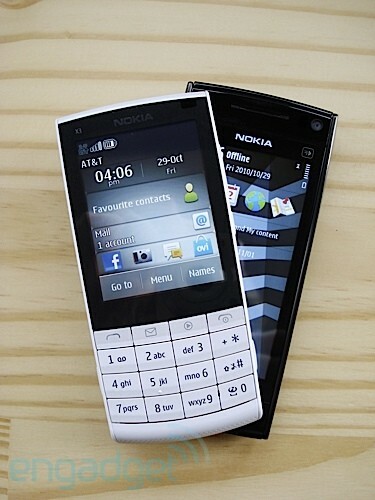 On the social networking front, the phone includes Nokia Communities along with a Facebook and Twitter client with a matching homescreen widget. For some unknown reason, we kept getting repeatedly logged out of our accounts and prompted for our passwords, so we eventually gave up. Hopefully Nokia will fix this in a future firmware update. On the plus side, the media player works very well and handles music and videos in a variety of common formats such as MP3, MP4, WAV, H.264, AAC+, XviD, WMA, and WMV. The picture editor also stands out. As for the rest of the bundled software, it's pretty much what you'd expect from a feature phone. 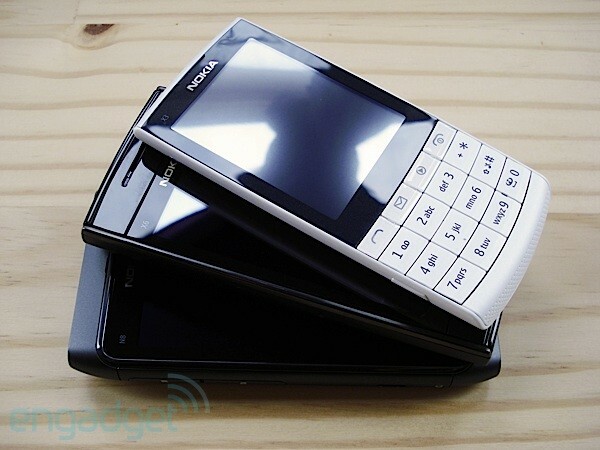 For additional content, the X3-02 supports Java apps and comes with Nokia's Ovi Store pre-installed. The Nokia X3-02 Touch-and-Type combines quality hardware with a pleasant user experience, but suffers from a lackluster OS and finicky software. It's a decent enough feature phone for those who simply want a durable, and low-cost ($200 unsubsidized) device that focuses on core functionality and offers a few extras in a small and familiar package. But for those who also seek GPS, multitasking, or Exchange integration on a budget, it's too little, too late: there's a growing number of budget smartphones -- like the T-Mobile Comet and the Orange San Francisco -- that eclipse the X3-02 at the same price point. The world is changing, and we're pretty sure that increasingly, most people will chose the smartphone over the feature phone. We're just not convinced that Nokia is paying attention.